‘Hybrid Organic-Inorganic Rotaxanes and Molecular Shuttles’, Chin-Fa Lee, David A Leigh, Robin G Pritchard, David Schultz, Simon J Teat, Grigore A Timco and Richard E P Winpenny, Nature, 458, 314-318 (2009). Full Article. Nature Podcast (19th March 2009). The tetravalency of carbon and its ability to form covalent bonds with itself and other elements are the cornerstones of organic chemistry, enabling large and complex (in terms of structure, function and dynamics) carbon-based molecules to be constructed. The electronic configurations and multivalency of metals and other inorganic elements, on the other hand, can impart diverse and useful electronic, magnetic, catalytic and other chemical and physical properties on molecular level structures. 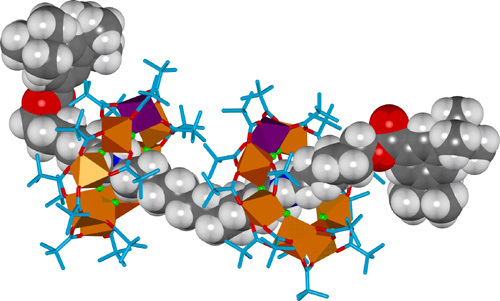 A team of chemists at the University of Manchester and the University of Edinburgh have now described the first discrete rotaxane molecules in which inorganic and organic components are linked together mechanically at the molecular level. An essentially inorganic wheel is assembled around a linear organic axle terminated with bulky ‘stoppers’ to form a hybrid rotaxane structure with dynamic properties that hitherto have been the preserve of organic molecules, such as the large amplitude thermal movement of the macrocycle up and down the axle (a ‘molecular shuttle’), a motion of interest for synthetic molecular machine systems. The threaded molecular architecture also ensures that the electronic, magnetic and paramagnetic characteristics of the heterometallic nuclear cages, which are part of a family of inorganic clusters viewed as potential components for qubits for quantum information processing, are intrinsically associated with—and can potentially influence and be influenced by—the organic portion of the structure. 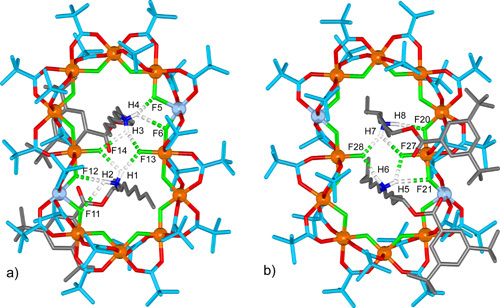 The ring components of the rotaxanes are octa- (Cr7CoF8(O2CtBu)16) or dodeca- (Cr10Cu2F14(O2CtBu)22) nuclear cages in which the metal centres are bridged by fluoride and pivalate (tBuCO2-) anions; the thread components feature dialkylammonium units that template the formation of the heterometallic rings about the axle(s) in 23-45% yields. The threads have bulky groups at each end of the axle to prevent subsequent dethreading of the rings. In a typical example of a hybrid organic-inorganic rotaxane synthesis (Figure 1A), a thread is reacted with a 7:1 molar ratio of Cr(III):Co(II) ions in the form of chromium(III) fluoride (CrF3.4H2O) and a cobalt(II) pivalate salt ([Co2(H2O)(tBuCO2)4(tBuCO2H)4]), with pivalic acid as the solvent, at 140 °C for 12 hours. The rotaxane is formed in 23% yield, remarkably efficient for what is essentially a 33 component assembly process (each metal-ligand bond is dynamic under the reaction conditions). Figure 1. 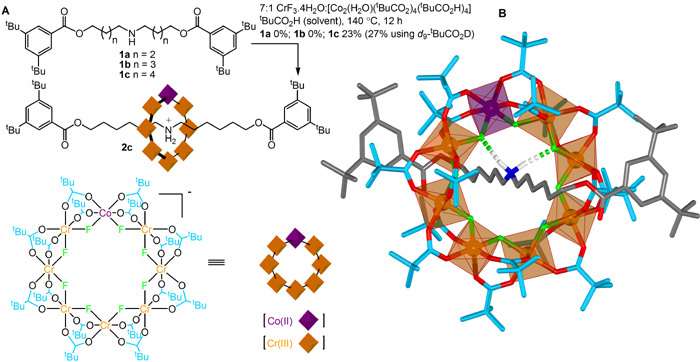 (A) Synthesis and (B) X-ray crystal structure of a hybrid organic-inorganic rotaxane. In the framework representation of the X-ray crystal structure (B) carbon atoms of the thread are shown in grey and of the pivalate groups in light blue, oxygen atoms red, nitrogen dark blue, fluorine green, cobalt purple and chromium orange. Hydrogen atoms (white) other than those of the ammonium group are omitted for clarity. The rotaxane is a neutral molecule, the positive charge on the ammonium thread balanced by the charge remaining on a heterometallic macrocycle consisting of 24 monoanionic ligands (eight fluorides and sixteen pivalate groups) bound to seven trivalent cations (Cr(III)) and one divalent (Co(II)) cation. The X-ray crystal structure (Figure 1B) shows the ammonium cation in the centre of the cavity of the macrocycle, forming short (~2.0 Å) F-…HN+ hydrogen bonds to two of the bridging fluoride ligands. Mass spectrometry confirms that each rotaxane molecule contains exactly one cobalt and seven chromium ions, the crystallographic data indicating the cobalt ion is disordered over the eight different metal sites in each ring. The X-ray structure shows the eight metal centers in each heterometallic wheel to be almost perfectly coplanar with the two faces of the ring virtually identical in terms of physical shape and geometry. Nevertheless, the wheel is intrinsically chiral (i.e. 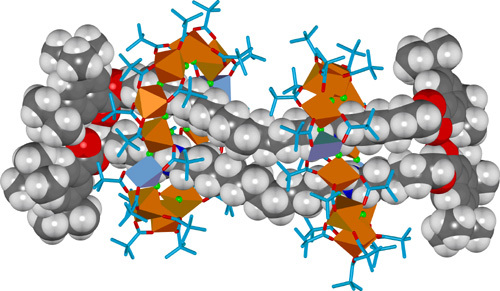 has a non-superimposable mirror image) because the one Co(II) ion must have either a (P)- or (M)- arrangement of the ligands in its octahedral coordination sphere. By using a thread with two ammonium sites instead of one, with a suitably long distance between, it is possible to form a rotaxane with two heterometallic rings on one organic thread (Figure 2). Figure 2. X-Ray crystal structure of a hybrid organic-inorganic rotaxane. Changing the divalent metal from cobalt(II) to copper(II) leads to an extraordinary rotaxane in which two thread molecules are circumscribed by two heterometallic macrocycles, each ring featuring ten octahedral chromium(III) ions and two square pyramidal copper(II) ions (Figure 3). The rotaxane is formed in a remarkable 37% yield from 98 components (twenty-four metal ions, forty-four pivalate groups, twenty-eight fluoride ions and two organic threads). Figure 3. X-Ray crystal structure of a hybrid organic-inorganic rotaxane. The different coordination requirements of copper(II) (five coordinate) compared to cobalt(II) (six coordinate) causes some enforced changes in the ligand arrangement for the heterometallic wheel, and in the rotaxane two of the fourteen fluoride ligands are bound to only one metal ion rather than bridging two. These two singly-coordinated fluoride anions play a central role as hydrogen bond acceptors in the intercomponent binding motifs of the rotaxane in the solid state, each being involved in bifurcated hydrogen bonding to two ammonium groups on different threads (Figure 4). Figure 4. Intercomponent binding motifs in the X-ray structure of the rotaxane. The linking of organic and inorganic components at the molecular level by mechanical bonding imparts features of both chemistries (e.g. dynamics, magnetism) to the overall structure, whilst introducing new and intriguing behaviour through the combination of the two (e.g. the differences in the mechanisms of rotational and translational intercomponent motion, new noncovalent binding motifs, extreme temperature-sensitivity of chemical shifts, an apparently novel templating mechanism, etc). Whilst it is premature to speculate on potential applications for hybrid organic-inorganic rotaxane-based molecular structures, it can be noted that the dynamic properties of organic molecular shuttles attract interest in areas from molecular electronics to drug delivery, and for their ability to do mechanical work at the molecular level, whilst the heterometallic wheels are members of a class of inorganic molecular magnets being investigated for quantum information processing. The provision of a simple and versatile synthetic route for linking inorganic and organic components by mechanical bonds at the molecular level opens the door to molecules with composite properties, including new behaviours and characteristics that may arise by combining features that have previously been the preserve of one type of chemistry with the other. C.-F. Lee, D. A. Leigh, R. G. Pritchard, D. Schultz, S. J. Teat, G. A. Timco & R. E. P. Winpenny, Nature 458, 314-318 (2009). 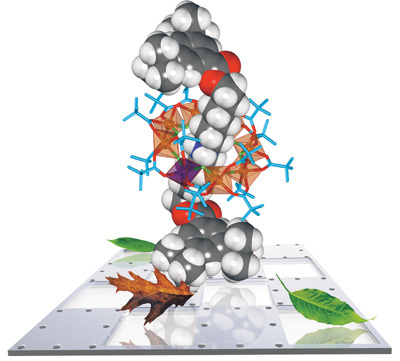 For polypseudorotaxanes featuring polyoxomolybdate clusters that encircle p-phenylenebutadiynylene polymer chains, see: M. A. Alam, Y.-S. Kim, S. Ogawa, A. Tsuda, N. Ishii, T. Aida, Angew. Chem. Int. Ed. 47, 2070–2073 (2008). P. L. Anelli, N. Spencer, J. F. Stoddart, J. Am. Chem. Soc. 113, 5131–5133 (1991). E. R. Kay, D. A. Leigh, F. Zerbetto, Angew. Chem. Int. Ed. 46, 72–191 (2007). (a) W. Wernsdorfer, Nature Mater. 6, 174–176 (2007). (b) S. Bertaina, S. Gambarelli, T. Mitra, B. Tsukerblat, A. Müller, B. Barbara, Nature 453, 203–206 (2008). (c) R. E. P. Winpenny, Angew. Chem. Int. Ed. 47, 7992–7994 (2008). (a) C. P. Collier et al., Science 285, 391–394 (1999). (b) J. E. Green et al., Nature 445, 414-417 (2007). T. Nguyen et al., Proc. Natl. Acad. Sci. USA 102, 10029–10034 (2005). (a) J. Berná et al., Nature Mater. 4, 704–710 (2005). (b) Y. Liu et al., J. Am. Chem. Soc. 127, 9745–9759 (2005).